My camera and I are inseparable most of the time. And I want to make sure that it’s protected when I carry it around. But that doesn’t mean I enjoy having to choose a camera bag over a beautiful stylish handbag. Can’t I have both? Last year I already shared that I have this thing with camera bags. It’s so hard to find the perfect one, hence the large collection of bags I’ve collected over the years. And then I found my ONA bag. Pretty close to being perfect, and still the bag I take with me almost every time I leave the house – with our without the camera. But…there’s always a ‘but’. It fits my camera with one lens, my phone and keys, but that’s about it. And that’s why I got it. I wanted a small bag that would also protect my camera. But there are moments when I would like to have a bag that’s a bit more elegant. One that would look good when you’re going to a fancy dinner, or when you’re traveling for work but also want to bring your camera. My go-to bag for traveling was usually my Kelly Moore Libby bag. An amazing (and beautiful) bag, but also very heavy. Perfect to fit all your stuff, but not one you want to carry around once you’ve reached your destination. So I came to the conclusion that what I was missing was a bag that’s big enough to fit a camera, laptop and maybe an extra lens, light enough to use as a camera / handbag, and stylish enough to not look like a tourist with her camera. And then Aide de Camp contacted me. Talking about perfect timing! If I would be interested in testing one of their bags? Well….Of course! Their bags look absolutely gorgeous and tick all the right boxes in terms of size, weight and looks. I decided to go for the Leyden bag. I also loved the Valencia bag, but thought that one might be too big to also use as a handbag. And the Evie would be too small to carry all the extra stuff for when I was traveling. So, Leyden it is. When it came out of the box, it was slightly smaller than I expected. But it’s incredible how much fits in it. And because of its material it’s super lightweight. But the real test came when I took the bag with me to North Carolina and New York. A business trip, so I had to bring my laptop, but since I would go to New York afterwards I also wanted to bring my camera. And it was perfect! I didn’t take an extra lens, so there was enough space to fit my Bose headphones, in addition to my camera, laptop and iPad. And because it has so many different pockets it all feels very organized. I seriously love this bag! And because you can easily remove the camera padding box, I’ve also been using it as my ‘work bag’ since I got back from the US. It just looks super stylish and people react very surprised when I tell them it’s actually a camera bag. 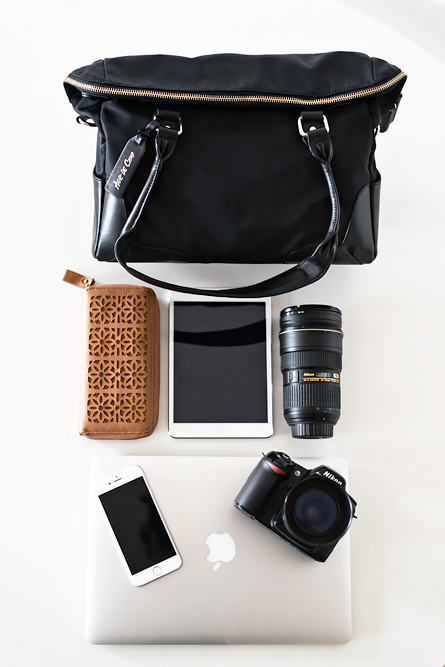 So, for all you women photographers out there looking for a versatile, beautiful camera bag that looks like a handbag, I highly recommend having a look at the Aide de Camp collection. The company is based in Singapore, but they ship worldwide.